Initiated in Carnatic Music at age of 12 by V.L . Seshadri, Unnikrishnan was inspired by Sangita Kalanidhi Dr. S. Ramanathan who shaped him into a competent and complete Artiste of aesthetic and technical excellence. He now receives guidance from Savitri Satyamurthy and Calcutta Krishnamurthy. He has also acquired "Veenai Dhanammal Bani" from Sangita Kalanidhi T. Brinda and T.Viswanathan. He is the recipient of many Honours and Awards which include "Kalaimamani" from the Govt. of Tamilnadu, 'Best Raaga' award from Music Academy, 'Yuvakala Bharati' from Bharat Kalachar. He has rendered concerts in all prestigious Sabhas in the country. His audio cassettes are most popular among rasikas. He is 'A' grade Artiste in AIR Simultaneously, his fame blazed in the film world as a play back singer for his renderings in two Tamil Films. 'Kaadalan' and Pavitra' which earned him the 'National Award' for 1994. He has made extensive concert tours to USA, South Africa, UAE, Australia and New Zealand. A B.Com graduate with Post graduate diploma in personnel Management, he is also a keen Sportsman. His passionate cricketing skills as Wicket keeper-Batsman were sacrificed at the Altar of Carnatic Music - no Regrets! Shri P.Unnikrishnan will be the proud recipient of the prestigious 'ISAI PEROLI' Award instituted by Kartik Fine Arts for the year 1998. Born on 9th July 1966 to Sri.K.Radhakrishnan (Director, Kesari Kuteeram Pvt. Ltd., manufacturers of Ayurvedic Proprietary Medicines) and Dr.Harini Radhakrishnan (Ayurvedic Physician). Married to Priya, a Bharathanatyam and Mohiniyattam dancer. Blessed with a son Vasudev Krishna on the 27th May 1997. Started learning Carnatic music at the age of 12 from Sri.V.L.Seshadri. Subsequently he trained under Sangeetha Kalanidhi Dr.S.Ramanathan. and continued training under Smt.Savithri Sathyamurthy and Sri.Calcutta K.S.Krishnamurthy. Attended a special workshop for six months on 'Veena Dhanammal Bhani' under Sangeetha Kalanidhi Smt.T.Brinda and Sangeetha Kalanidhi Dr.T.Vishwanathan. He is currently training under Vidwan P.S.Narayanaswamy. Holds a B.Com degree from the Madras University. Did his General Law and Post Graduate Diploma in Personnel Management and Industrial Relations. Is a cricket enthusiast who played for the Tamil Nadu senior division league as a top order batsman and wicket keeper. Was employed as an executive in Parrys Confectionery Ltd. from 1991 to 1994 and resigned to take up music as a full time profession. Is a member of the Madras Cricket Club and Life Member of the Tamil Nadu Cricket Association. 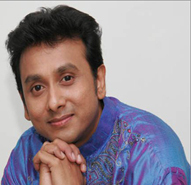 P. Unnikrishnan was conferred the title 'Isai Peroli' by Karthik Fine Arts, on Sunday the 6th of December 98. Was awarded the title 'Yuva Kala Barathi' by the Bharath Kalachar, the title 'Nada Bhushanam' conferred by the Shanmukhananda Fine Arts, New Delhi and the title 'Kalaimamani' by the government of Tamil Nadu. Received the National Award for the Best Male Playback Singer for the year 1994 for his first ever film song 'Ennavale' (Kadalan) and 'Uyirum Neeye' (Pavithra). Received various awards from the Music Academy, Chennai, and other prestigious institutions. Recorded over 600 film songs for Tamil, Telugu, Kannada and Malayalam films. Has more than 25 albums on cassettes and CD's to his credit. Is an "A" grade artiste of the All India Radio and has given a number of concerts all over India, U.S.A, The Middle East, The United Kingdom, The Far East, Australia, New Zealand and South Africa.